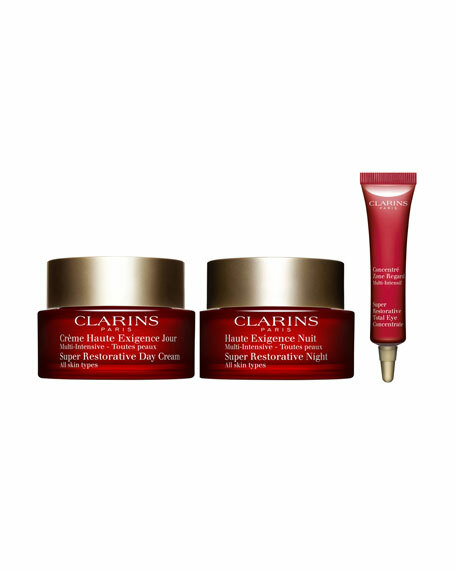 A limited edition Super Restorative collection gift set. Powerfully replenishing face & eye formulas zero-in on wrinkles, age spots and loss of firmnessgiving a visible lift to mature skin weakened by the natural aging process. Deep replenishing formulawith Harunganahelps visibly restore skin's density and vitality. Deep wrinkles are noticeably diminished. Powerful spot-correcting formula helps unify the complexion with Montpellier Rock-rose. Night-after-night, skin's density is visibly replenished. Skin appears radiant and youthful-looking. All-in-one anti-aging eye treatment helps smooth deep wrinkles and reduce the look of puffiness and dark circles. For in-store inquiries, use sku #2609631.